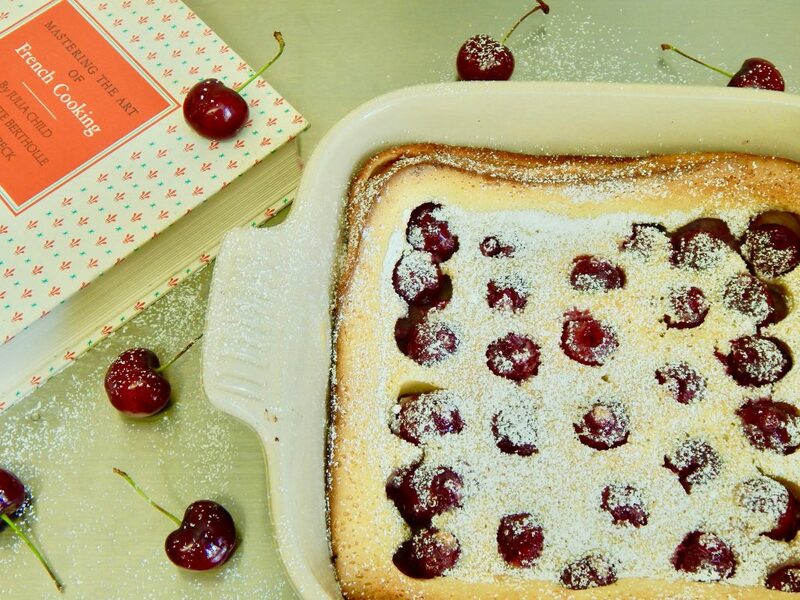 You guys, today would have been Julia Child’s 106th birthday! 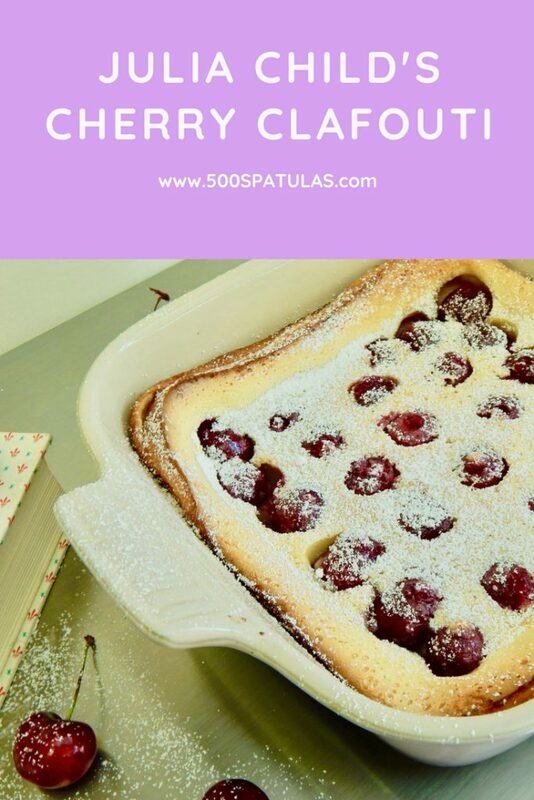 To honor her memory and everything she did for the cooking world and women in it (and because it’s cherry season), I’m sharing her iconic Cherry Clafouti recipe. Cheers, Julia! Preheat oven to 350 degrees. 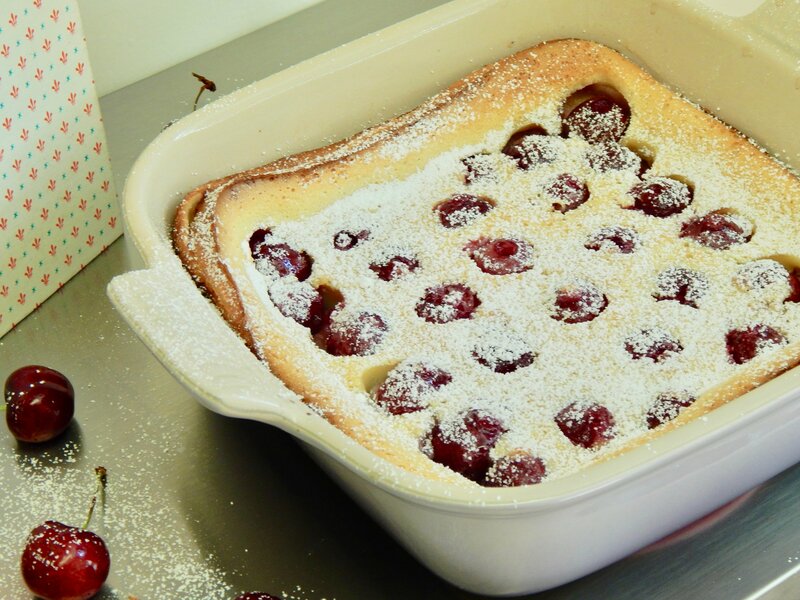 You will need a fireproof (stove-safe) 7 – 8 cup baking dish or pie plate. Butter (or spray) the dish and set aside. See alternate instructions below if you don’t have one. 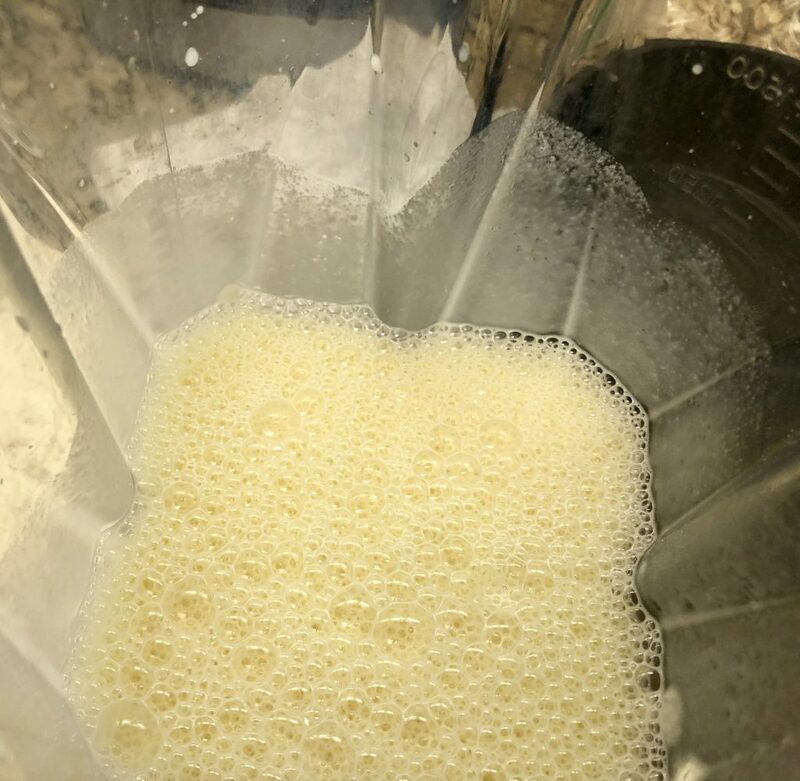 Place the milk, 1/3 cup granulated sugar, eggs, vanilla, salt and flour in a blender. Cover and blend on high for 1 minute. Add a 1/4 inch layer of the batter to the prepared baking dish. Place over medium heat for 1 – 2 minutes. 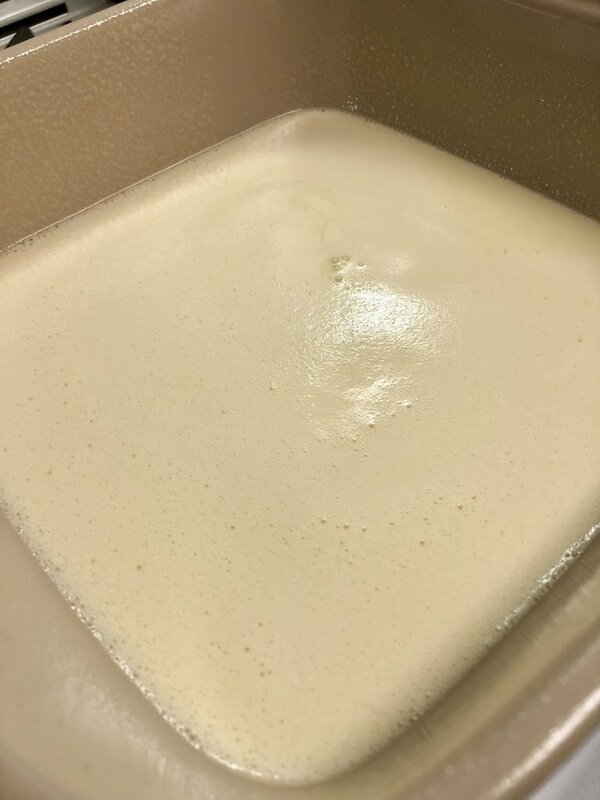 A film of batter will set towards the bottom of the dish. Remove from heat. ALTERNATE PAN INSTRUCTIONS: Place dish into the oven for about 7-10 minutes, until a film of batter sets in the pan but the mixture is not baked through. Remove from oven (but don’t turn the oven off, yet). 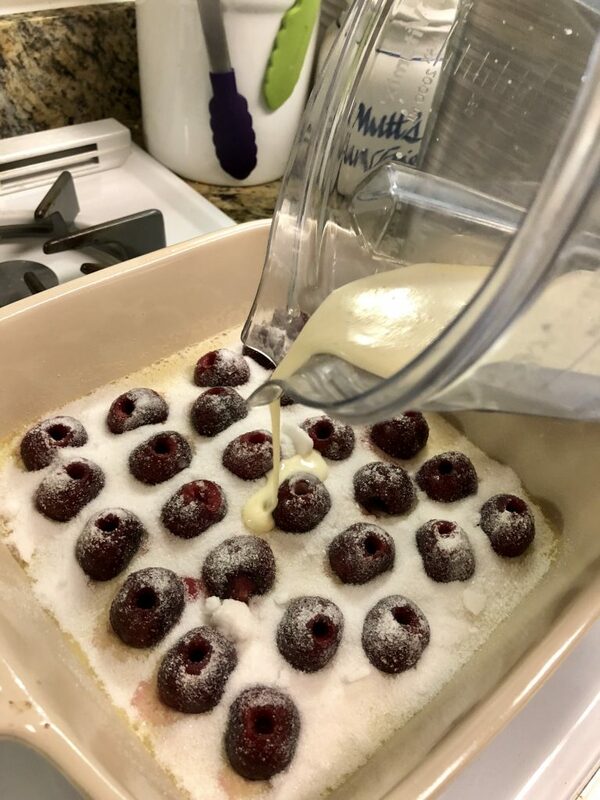 Spread the cherries over the batter and sprinkle 1/3 cup granulated sugar over them. Pour on the rest of the batter and smooth the surface with the back of a spoon. Place in the middle position of preheated oven and bake for about an hour. 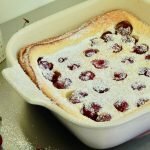 The clafouti is done when it has puffed and browned, and a toothpick comes out clean. When serving, sprinkle top with powdered sugar just before bringing it to the table. Serve warm. NOTE: It will sink slightly as it cools. 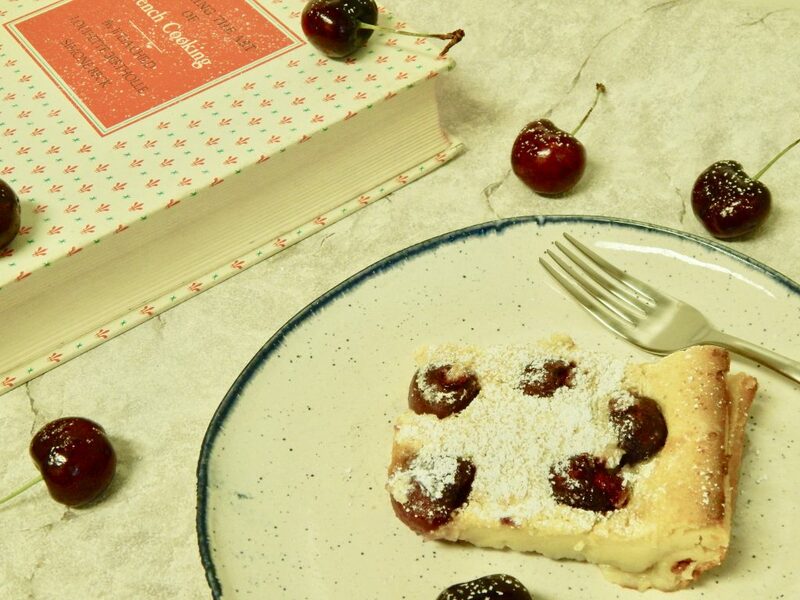 NOTE: Use fresh, black, sweet cherries in season. 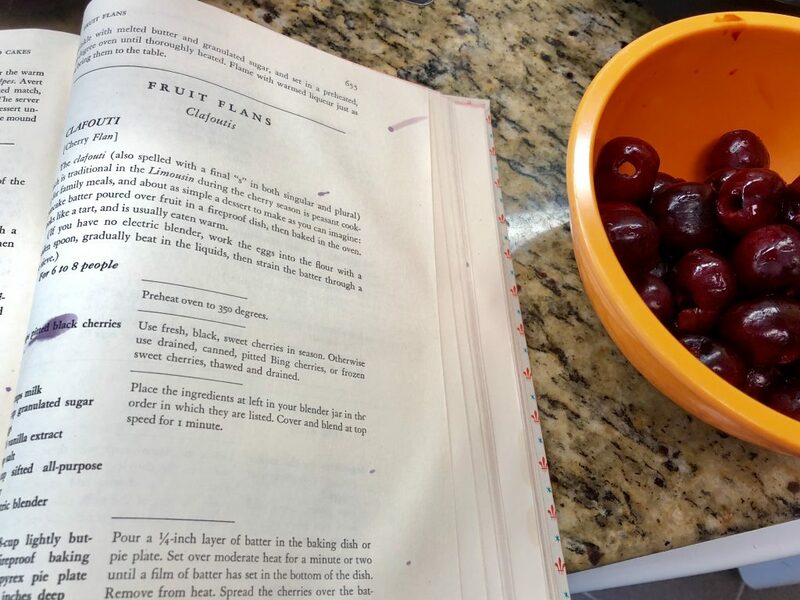 Otherwise use drained, canned, pitted Bing cherries, or frozen sweet cherries, thawed and drained. Preheat oven to 350 degrees. You will need a fireproof (stove-safe) 7 - 8 cup baking dish or pie plate. Butter (or spray) the dish and set aside. 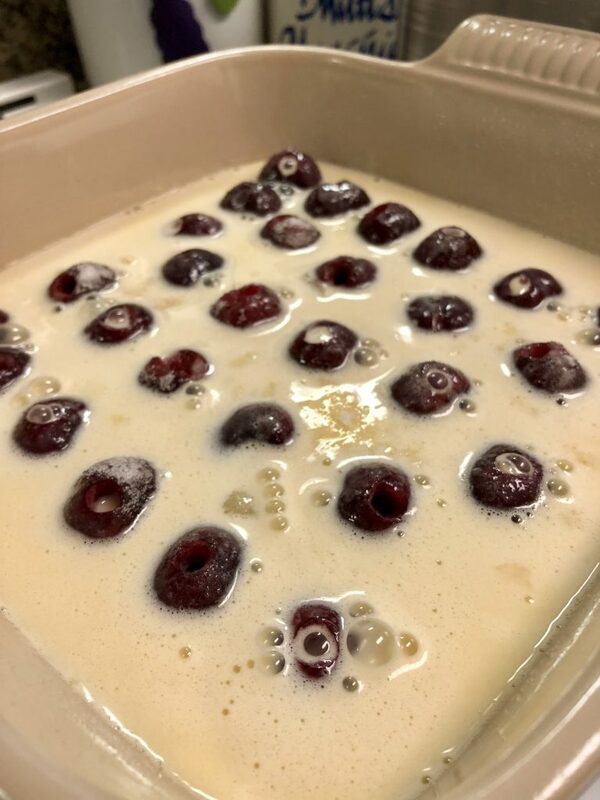 Add a 1/4 inch layer of the batter to the prepared baking dish. * Place over medium heat for 1 - 2 minutes. 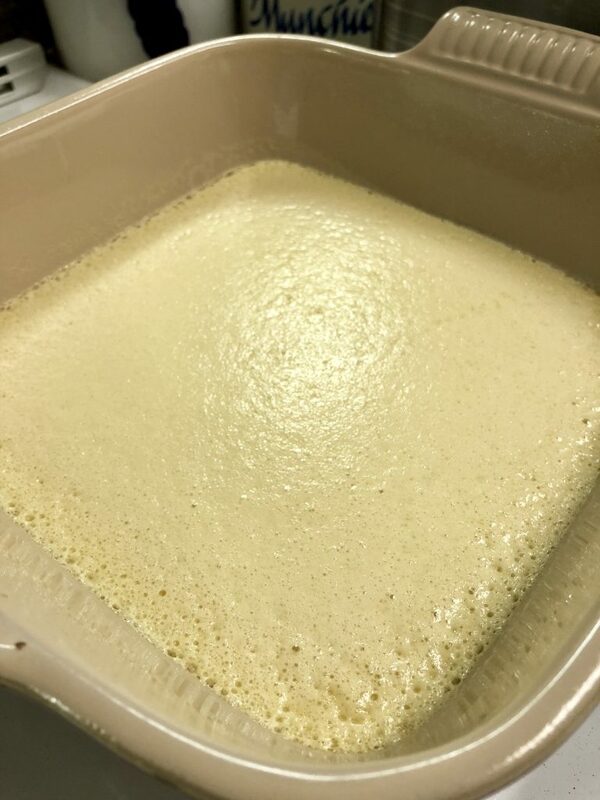 A film of batter will set towards the bottom of the dish. Remove from heat. 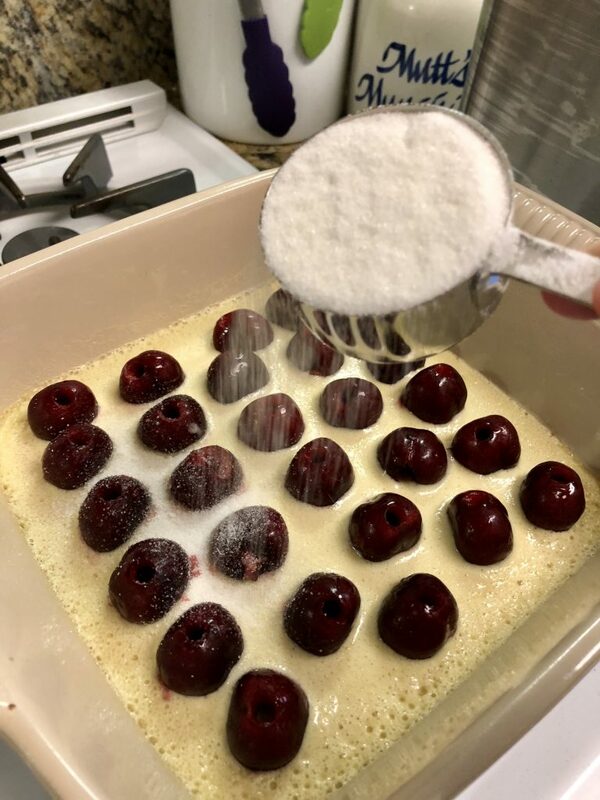 Spread the cherries over the batter and sprinkle 1/3 cup granulated sugar over them. Pour on the rest of the batter and smooth the surface with the back of a spoon. 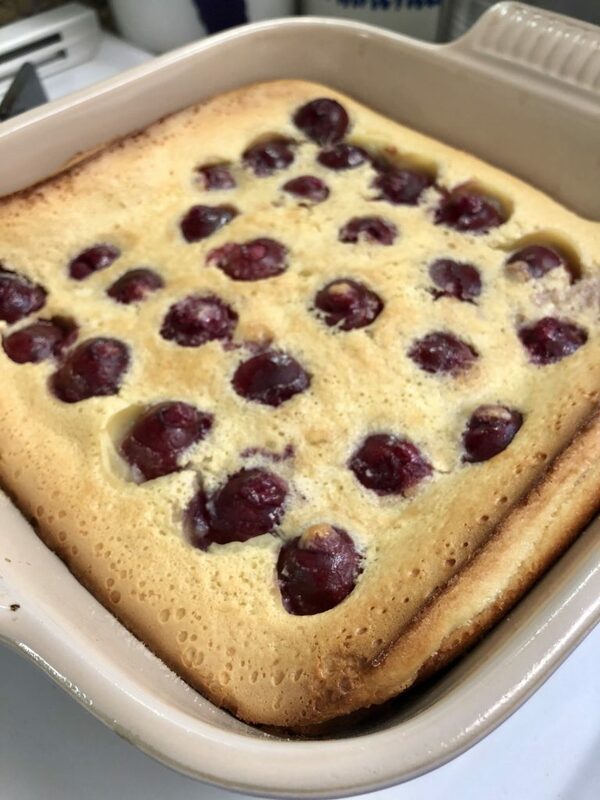 *ALTERNATE PAN INSTRUCTIONS: Place dish into the oven for about 7-10 minutes, until a film of batter sets in the pan but the mixture is not baked through. Remove from oven (but don’t turn the oven off, yet). Spread the cherries over the batter and sprinkle 1/3 cup granulated sugar over them. Pour on the rest of the batter and smooth the surface with the back of a spoon.